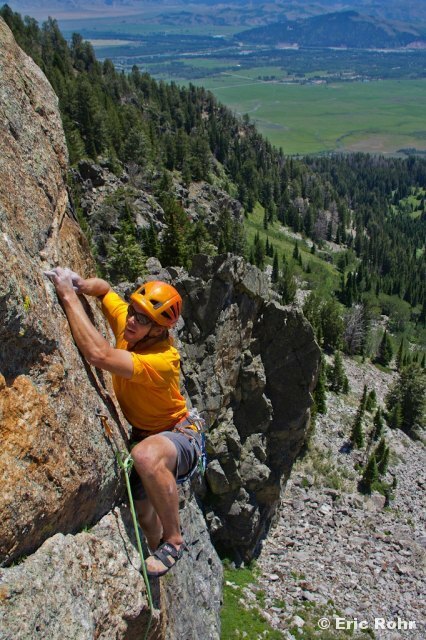 Of Jackson Hole’s cragging opportunities, Rock Springs Buttress is by far the best overall day climbing experience. 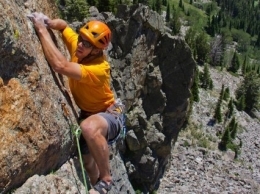 Not only does the Buttress offer the highest concentration of quality day-cragging in the immediate region, but the quality of climbing here is also high caliber for any part of the country. 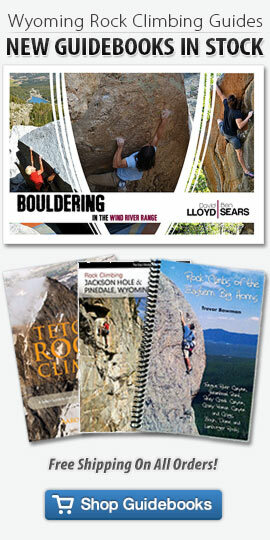 Moreover, the variety of rock climbing styles and disciplines is diverse. The climbing here comes highly recommended. 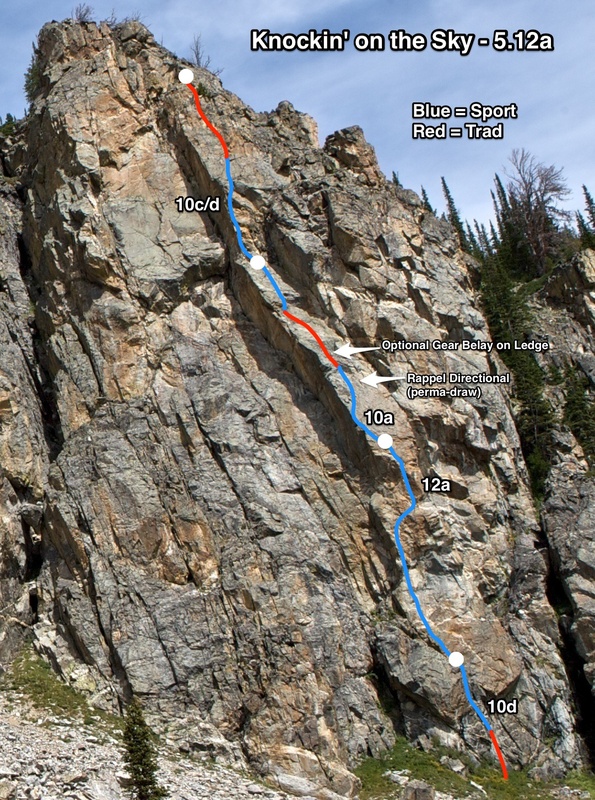 Knockin’ on the Sky is a worthy addition to Rock Springs Buttress that was established by Toby Stegman and Wesley Gooch in October of 2012. 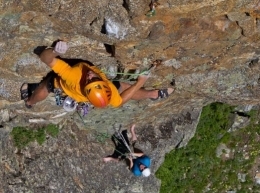 The climbing is made up of a mixture of well-protected sport with intermittent sections of moderate cracks. 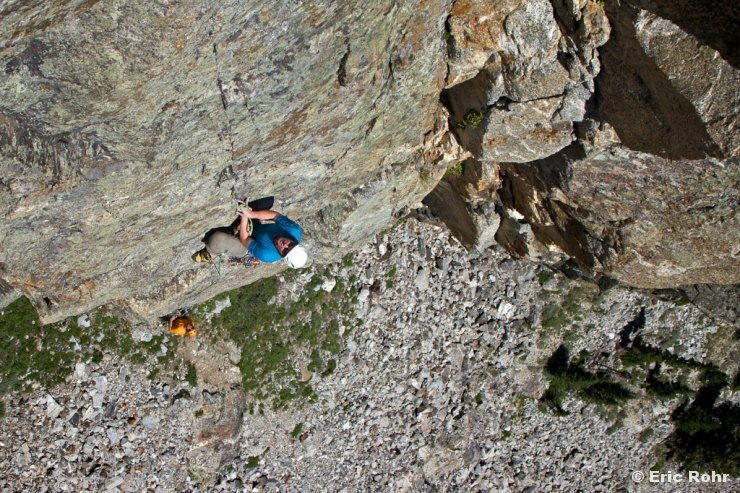 The route’s second-pitch crux is the obvious prize but all pitches are classic! 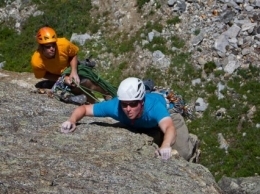 Knockin’ on the Sky is a long, memorable, and safe route – a worthy challenge for capable teams. 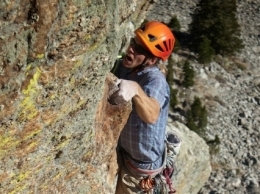 The route charges up new territory on the far right side of the East Buttress. Expect a line that flows naturally while encompassing feature-rich granite, steep faces, overhanging flakes, and two sections of wildly exposed arête slapping fun! Photos ordered sequentially by pitch. 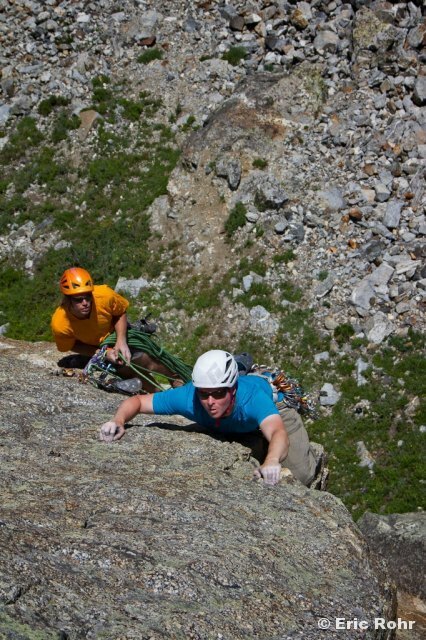 Climbers: Orange shirt is Toby Stegman. Blue shirt is Wesley Gooch. Photos © Eric Rohr and Laura Krusheski. Short & powerful. Very thuggish. 2 bolts. 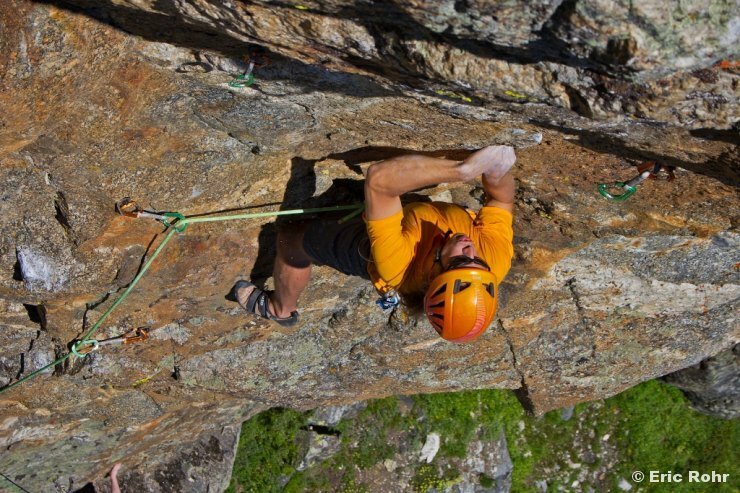 2nd bolt is tough to clip (clip hold out right) – belayer be ready! 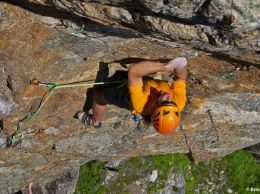 P1 Variation (5.9 trad) – Continue up the crack system to the right of the bolt line and pull a small roof/bulge to gain the ledge and belay. Well protected. Classic! 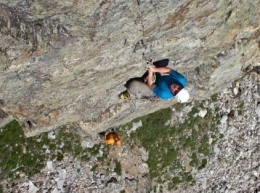 Multiple cruxes – one at mid-height and a second (harder) near the top. 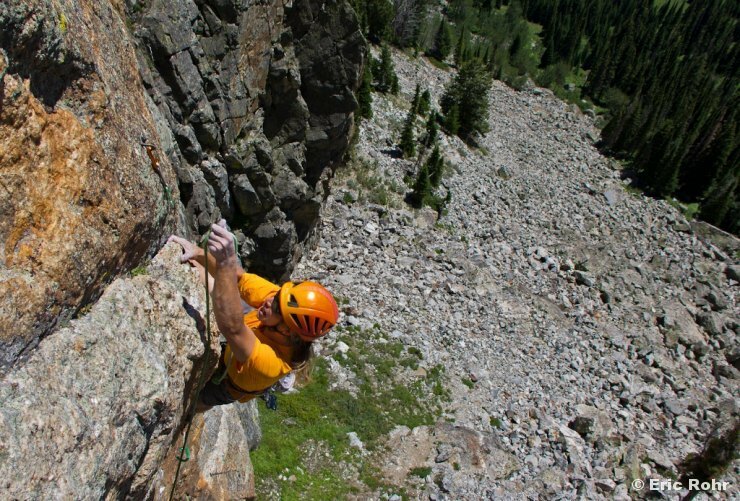 Finish on a hanging belay. 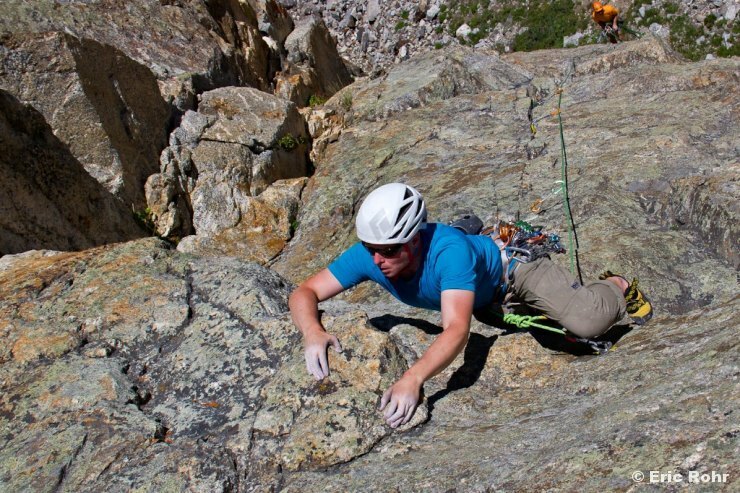 Super fun arete directly above belay, fun slab climbing, section of easy trad, and fun roof pull to finish. 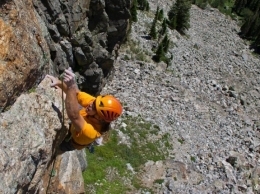 Optional gear belay about halfway on a good ledge or finish at a bolted hanging belay. 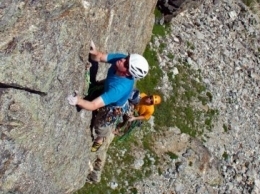 Work both sides of the arete. 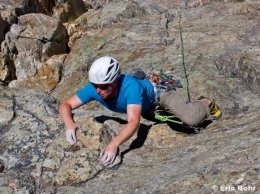 Crux is hard to read. 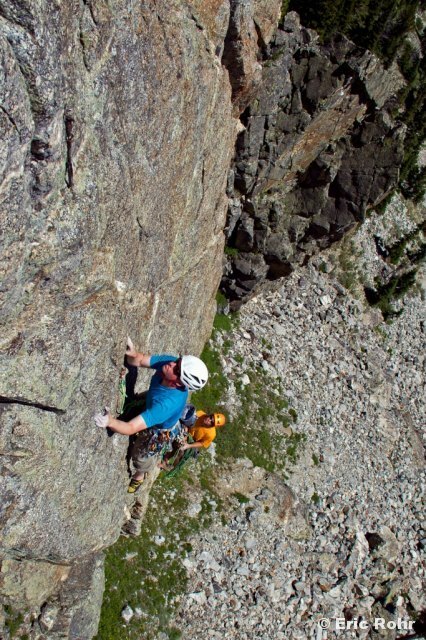 Good ledge to belay from on top. 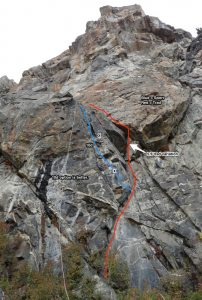 A 70m is rope required!! 14 sport quick-draws and one 24-inch trad draw. Single set of cams to 2 inches. 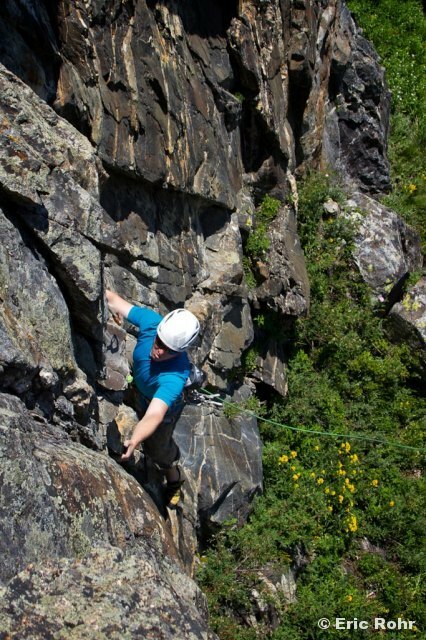 A 70m rope is required!! 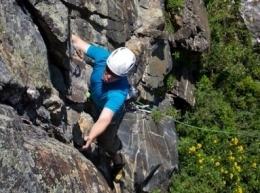 Rappel is very airy and not direct. 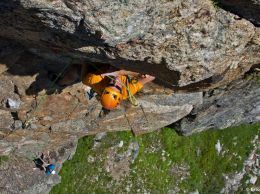 The second rappel requires clipping a directional perma-draw to stay in line – go slow, or risk swinging into outer space! 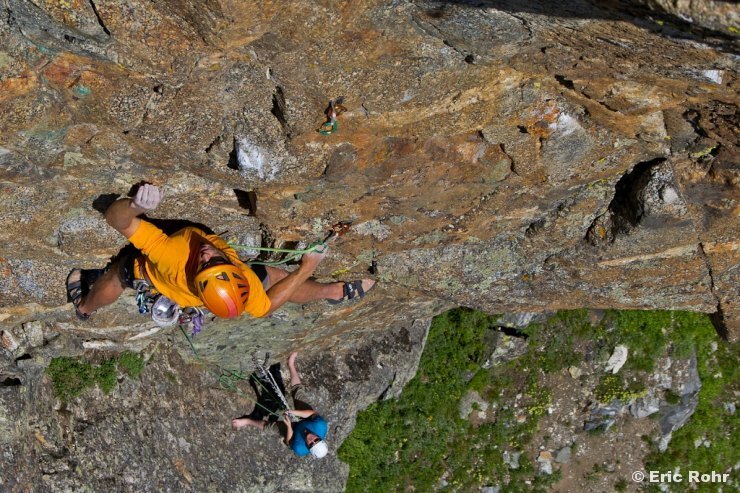 Note: First person down the second rappel should clip a few bolts for directionals before the perma-draw and give the next climber down a fireman’s belay. 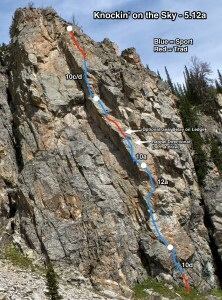 Refer to the Jackson Hole Day-climbing Guide for more info on Rock Springs Buttress. 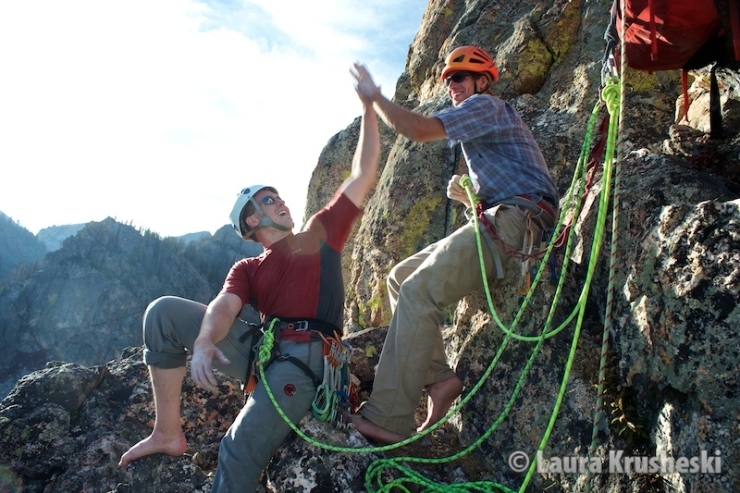 Photo Gallery Updated: Two new photos have been added of pitch 4 (5.10d) by Laura Krusheski. 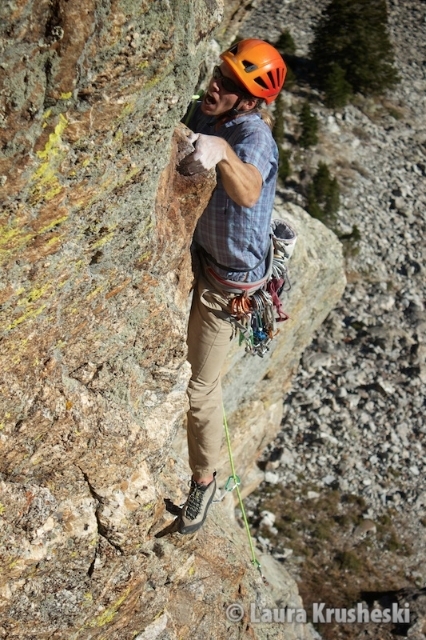 Thanks Laura and Eric for the great photos! To those who have struggled with them, the mountains reveal beauties that they will not disclose to those who make no effort. That is the reward the mountains give to effort. 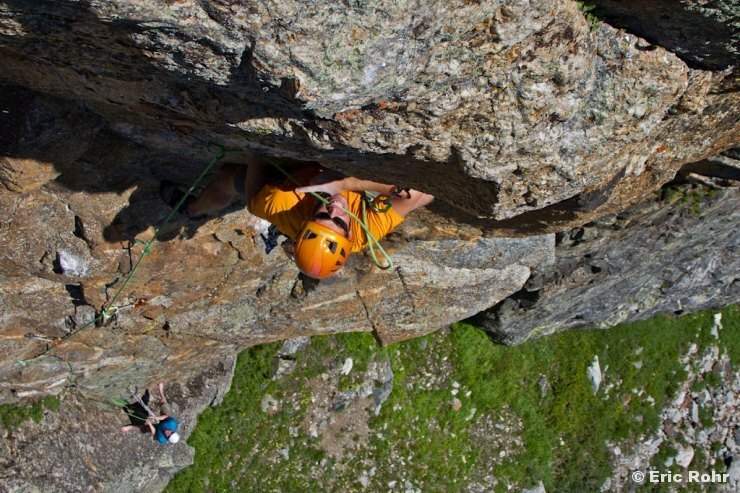 And it is because they have so much to give and give it so lavishly to those who will wrestle with them that men love the mountains and go back to them again and again. 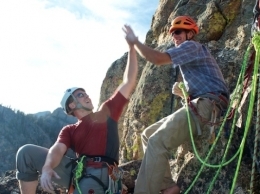 The mountains reserve their choice gifts for those who stand upon their summits.